We are well-known Manufacturer of Snow White Quartz Powder. The Snow White Quartz Powder, which we offer, is well-known for premium quality for Cosmetic Glass manufacture and eco-friendly nature. Our Quartz Powder is widely used in various industries. This is Natural silica having purity more than 99.7% of SiO2. This powder comes in very snow white color.The whiteness in A-Grade silica is more than 96%.This is Natural silica having purity more than 99.7% of SiO2. This powder comes in very snow white color. snow white quartz powder is the most abundant and most common mineral on the earth. It is found in almost every geological environment and also it is at least a component of almost every rock type. It has a hexagonal crystal structure and is made of trigonal crystallized silica. It is most varied in terms of varieties, colors and forms. 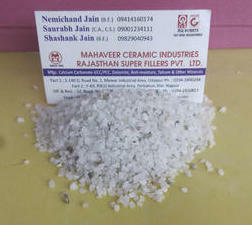 Owing to our immense experience in the domain, we have established ourselves as a renowned manufacturer and supplier of Quartz 6-12 Powder in Udaipur, Rajasthan, India. Offered Quartz 6-12 Powder are extensively used to prevent shearing and shrinking of the paint film. These Quartz 6-12 Powder is processed by making the use of latest techniques at our sophisticated processing unit under the strict direction of our experts. Moreover, the offered flakes are provided in various packaging options at nominal costs.